Microsoft is bringing an Xbox Avatars editor to the Windows 10 Technical preview, hinting at a big return for the cartoon creations. The free app lets users tweak every part of their digital Avatars, including facial appearance, clothing, props, and accessories. 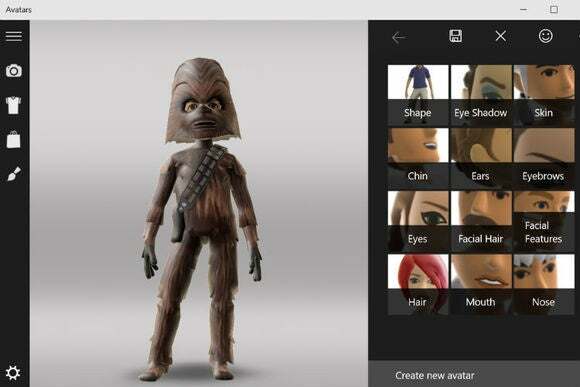 According to Windows Central, Microsoft is selling additional customizations through an “Avatar Store.” An image shared by Microsoft’s Larry “Major Nelson” Hryb shows a player dressed up like Chewbacca. Microsoft introduced Avatars on the Xbox 360 in 2008, and they appeared prominently when viewing friends’ activity on Xbox Live. But on the Xbox One, they’ve seen a diminished role. While the console ships with an Avatars app, the characters no longer appear in activity feeds and friends lists. Some Kinect games make use of the characters, but now that the basic Xbox One doesn’t include Kinect, most users have no reason to deal with Avatars at all. In January, a pair of Microsoft job postings suggested that Microsoft wants Avatars to play a bigger role. The postings spoke of spreading Avatars across “a wide scale of devices,” and making them look better. “As we cross the threshold to a unified operating system and product experience across Microsoft, it is time to for Xbox avatars to also advance to the next level,” one posting said. The Windows 10 app could be the first step in this process. The story behind the story: Microsoft said in January that it’s working on deeper ties between the Xbox console and Windows. A separate Xbox app for Windows 10 already lets players view messages, achievements and friend activities from their PCs, and in the future they’ll be able to stream Xbox games and partake in cross-platform multiplayer. Avatars may not seem like a major contribution right now, but it could become part of the glue that bonds everything together.